Seattle Weekly recently ran an article emphasizing that some of the best music in this town happens on Tuesday nights. As if to prove the point, a bunch of my buddies from the Conor Byrne open mic are playing a show down the street at the illustrious Tractor Tavern tonight! Up first will be Lowlands in full-band glory. As a duo, Tom Rorum and Joel Schuman have been one of my favorite acts at Conor Byrne. 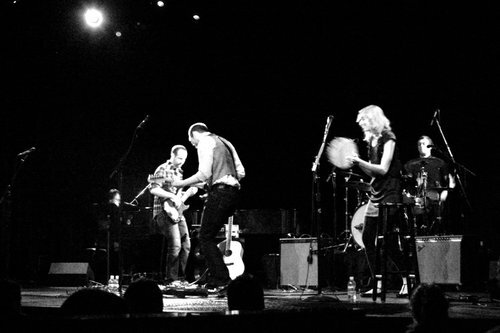 Like much of the talent that graces the stage every Sunday night, Lowlands features thoughtful lyrics and memorable melodies. It’s their full bodied energy and barely-controlled-raucousness, however, that makes Lowlands such a striking crowd-pleaser. I am convinced that one day Tom Rorum will stomp his flip-flop-clad foot right through that stage. Watch this video and share in my delight/concern. 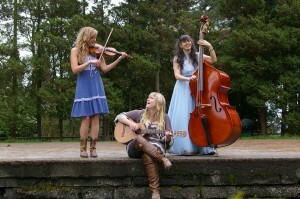 Next, The Gloria Darlings – Pandi, Rachel, and Rebecca – will celebrate their album release. 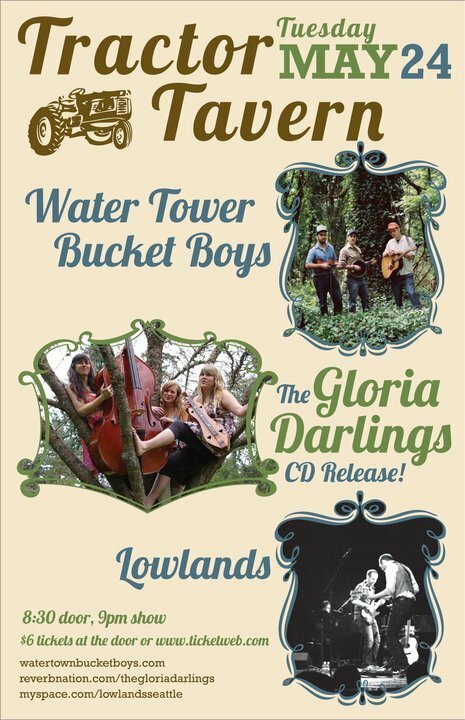 The Gloria Darlings inhabit many worlds as youthful torchbearers for traditional American Folk melodies and instrumentation. Not “folk” as in “umbrella term for acoustic, lyrical singer/songwriters.” Nope, we’re talking real Folk with mountain dulcimers, autoharps, classic harmonies, and instant sing-alongs. Throw in a splash of Adora-core and a penchant for defying the assumptions that come upon an all-female string band, and you get The Gloria Darlings. 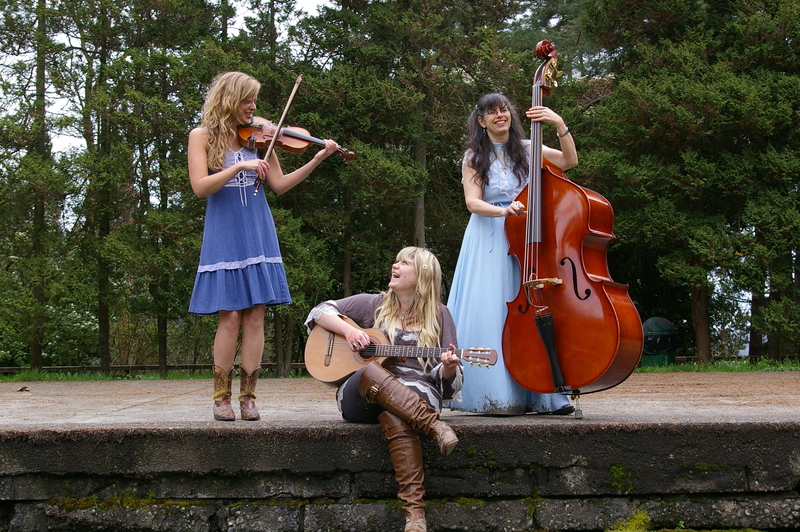 Already embraced by the vibrant Northwest Folklife community and recently selected as finalists for Northwest String Summit, this release and the months to come are sure to be very exciting and fun to watch. 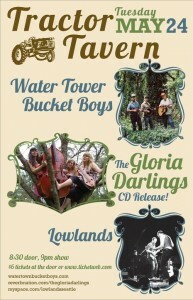 It’s also worth mentioning that the headliner tonight, Portland’s Water Tower Bucket Boys, are a big hit themselves. They’ve been getting love from Greg Vandy on KEXP’s The Roadhouse, which makes me think this show would be worth getting to early to ensure you get a ticket. Doors open at 8:30pm, $6 at the door. Asking questions are really nice thing if you are not understanding anything entirely, however this article presents fastidious understanding even.